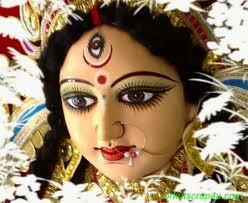 Durga Puja is a festival, which is observed for 10 days. Odisha ( Orissa ), the land of Lord Jagannath,the land of powerful Hindu Kingdom, the land of Raja & Maharajas, the royals of Odisha patronage anuual Sharodiyo Utsav before the state abolition with Republic of India. The Durga Puja is celebrated in two different ways in Orissa. In Shakti peethas (temples of goddess) the Durga Puja is observed with proper rituals for 10 to 16 days known as Shodasa Upachara/Shohala dinatmaka,which starts from 7 days earlier to mahalaya called as mulastami and ends on Vijayadashami, dussehra. Goddess Durga is also worshiped by devotees in different pandals in form deities across the state. The pandals are decorated with beautiful decoratives. According to Markandeya Purana the King of Chedi dynasty Suratha started rituals of Durga Puja during 300B.C.The Chedi dynasty belongs to Kalinga(modern Orissa). Durga Puia has different names in different Puranas and Sastras. In Devi Purana & Kalika Purana it is named as Vijaya Dashami. It is named as Mahaparbana in Devi Mahatmya and Duseehera in Markandeya Purana. The present form of worship of Durga with earthen idol in Orissa was started during the reign of Ganga King Chodaganga Dev in the 11th century at Puri. The earthen idol of Mahishamardini Durga is known as Gosani and the Dussehra fesival is known as Gosani Yatra. It is noteworthy that the co-worship of Mahisamardini Durga with Madhava (Lord Jagannath) is prevalent from 11th century, Eastern Ganga dynasty period, in Puri. It is said that in the year 1512 to 1517 Chaitanya Deva had come to Cuttack, the capital of Gajapati empire of Orissa and the then emperor of Orissa Gajapati Pratap Rudra Dev received him at Gadagadia Ghata situated near the river bank of Mahanadi very close to the kings Palace popularly known as Barabati fort. In that year Sri Chatanya Deva started Durga puja at Binod Bihari temple presently known as Balu Bazar. Further it is also believed that Netaji Subhas Chandra Bose, whose birth placed is Cuttack had organized Durga puja with great pomp and show to organize youngsters in British India exactly like Lokamanya Balagangadar Tilak had done it at Maharastra(the Ganesh Utsav). A pandal in Orissa is called Medho. For many years, the most expensive installation was the ChaandiMerrha (Chaandi means Silver) of Choudhuri Bajaar area of Cuttack. The ornamentation was done entirely in silver. A substantial increase in funding has led to the gold plating of the ornamentation. Now it is known as Suna Medho (Suna means Gold). A few other Pujas in Cuttack now have silver ornaments, too.